Impact of Ascending/Rising Sign - Libra, Application of Jyotish Remedies, Kavach, Propitiatory Remedies in Astrology, visit: http://www.JyotishRemedies121.com for Ascendant-wise simple and tested propitiatory remedies. "Impact of Ascending Sign - Libra"
The sign Libra is ruled by the planet Venus. It is the mooltrikona sign of Venus. It rules lumbar region, skin, kidneys and bones of the lumbar region. The sign Libra rising in the ascendant gives a magnetic personality, if Venus is fully strong. The person makes use of the body language for communicating with others. If Venus is weak and/or afflicted in a Libra nativity, the person suffers from diabetes, venereal diseases, arthritis, gout pains and renal diseases. It is a talkative, positive, airy and semi-fruitful sign. Its talkative characteristic provides the person capacity to communicate, including the use of body language and facial expressions for making the communication more effective. Its positive characteristic makes the person a contributor instead of being only a consumer. Its airy characteristic makes the person a thinker. Its semi-fruitful characteristic blesses the native with affluence and resourcefulness in life. The sign Libra signifies sense of justice, clarity, strong will power, optimism and is highly sensitive. Librans are intelligent, restless and good natured and have a pleasant disposition. They want to win others with love and hate violence. They have keen interest in performing and fine arts. The weakness and affliction to Venus can turn them into depressed, stubborn, argumentative and annoying persons. Librans are cautious, confident, interested in learning, gentle, artistic, and capable of getting out of difficult situations. Libra is a comparatively fortunate sign to be born in. The lord of the sign is an affluent planet and is significator for enjoyments and comforts. It gives advisory roles in the fields of finance and law, makes the person a life saviour through the practice of medicine and gives tremendous growth in business activities. The reason is, that apart from Rahu and Ketu, Mercury is the only planet that acts as a functional malefic for Librans. As Mercury is a fast moving planet, obstructions caused by its transit over natal positions are short lived. A strong and unafflicted Venus blesses all good things mentioned herein before. Endeavours of Librans are signified by Jupiter as per its strength in the nativity. Strong Saturn, being yogakaraka planet for this nativity, makes the person worldly wise and shrewd. The life and business partners of Librans are highly active as they are signified by Mars. They easily conduct their professional affairs as their tenth house is ruled by the Moon. The eleventh house, signifying income, elder brothers, friends and desires, is ruled by the royal planet, the Sun. They think big, and enjoy successes of a high order. They enjoy the patronage of highly placed friends, elder brothers and governmental authorities, whenever the Sun is strong in the nativity. This is the reason why big industrialists are always friendly with top political bosses. Strong Mercury assures a disease-free and happy married life for Librans. Further peculiarities of natives with Libra as the ascending sign are discussed in the case studies for better understanding. The ascendant is closely aspected by its lord, Venus, which gave the native a handsome physical structure and pleasant disposition. At the time of the birth of the native, he was running the main period of Venus up to the seventeenth year of age. This gave good school education, which enabled the native to go in for medical education, as practice of life-saving drugs is one of the professions ruled by the planet Venus. The functional malefics do not form any close conjunctions/aspects in the nativity. That is why the native is leading an affluent and reputed life with occasional disturbances caused by transit influences. Jupiter is in the state of old age, while infant Mars is in its sign of debilitation. The yogakaraka, Saturn, is well placed in the ninth house. The weak and debilitated Mercury aspects its own mooltrikona sign in the twelfth house. The weakness of Mars has given weak health to wife who is diabetic. The weakness of the Sun has resulted in the loss of highly placed friends. The weakness of Jupiter has denied the happiness of younger brothers and initiatives in life. The native has many friends because of his magnetic personality. Mars, because of its weakness, is not in a position to bestow any benefits. The sign Libra rises in the ascendant, whose combust lord in conjunction with the Sun, is placed in the second house. The boy is handsome and makes use of his facial expressions in conversation. Functional malefics, Mercury and Ketu, are closely conjunct with the mid-point of the ascendant. Their association gave the boy the habit of intoxication very early in life and the diseases of fits, in the Rahu's sub-period in the main period of Jupiter. The yogakaraka planet, Saturn, though weak, occupies the fifth house. Both the Sun and the Moon are rightly placed, giving birth to the child in an affluent family with long living parents. The placement of the tenth lord, the Moon, close to the mid-point of the ninth house, has given rise to the business of export of articles governed by the Moon. The placement of Jupiter in the tenth house has given tremendous initiative concerning business at a young age. Jupiter occupies tenth house in exaltation. The placement of the lord of the seventh house in the twelfth house delays the celebration of marriage. During the sub-period of Mercury in the main period of Saturn, the boy was almost a drunkard. Health was badly affected. The Sun in the second house is aspected by another functional benefic, exalted Jupiter, closely. This gave a high status to father, elder sister and promises affluent income to the native. Owing to potentialities in the chart in favorable periods, the bad habits of the native could be controlled. With the astral remedial measures, health also improved remarkably in the sub-period of the Moon in the main period of Saturn. The functional malefic, Mercury, afflicts the mid-point of the ascendant, Venus, the Sun and Saturn, by way of aspect/ conjunction. The functional benefics, the Sun, Saturn and Venus, though afflicted with Saturn and Venus being weak, as well, create an auspicious combination, which influences the mid-point of the ascendant. The Moon and Jupiter are weak due to their being in the state of infancy and placement in inauspicious houses. The Mars is weak due to infancy. The afflictions to the lord of the ascendant and the ascendant have reduced the attractiveness of the personality to a great extent, but traits of Venus, that is, pleasant disposition, etiquette, affluence, has helped the native to achieve a tolerably good financial and social status. Rahu and Ketu do not form close conjunctions. 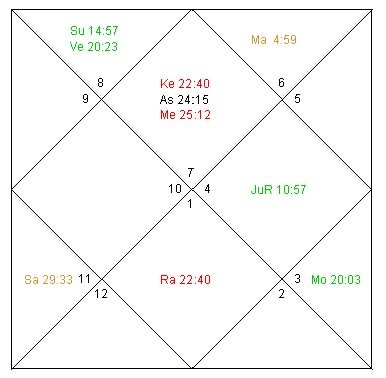 The native is troubled for a period of about six months, almost every three years, when Rahu and Ketu form transit conjunctions with weak natal planets. The malefic Rahu closely aspects and afflicts the weak Sun in the chart. The lord of the ascendant in close conjunction with another functional benefic planet, Mars, is placed in the tenth house. The functional benefic planet Moon is exactly conjunct with the most effective point of the fourth house and influences both the tenth and fourth houses. Jupiter is weak as it is badly placed, in the state of infancy, debilitated in navamsa and has a weak dispositor. The functional benefic planet Saturn is strong and closely conjunct with the most effective point of the second house. The native is a beautiful multi-millionaire blessed with affluent, long living parents, happy marital life and three sons. The weakness of Jupiter has not made the native dynamic and enterprising, and she is leading a passive life. Well-placed Moon and Venus make the native generous, wealthy, kind and royal in nature. The charm of personality increased during the dasa of Venus and the native could be seen often in the company of highly placed ruling politicians of the country in the capacity of a journalist. Rahu-Ketu axis is close to the mid-point of the houses occupied and aspected. Whenever this type of situation prevails and the lord of the ascendant is weak, the proper development of the child is retarded giving rise to undiagnosed and incurable diseases. This boy is suffering from excessive corpulence, as the infant lord of the ascendant, Venus, is under the exact aspect of Rahu. Functional malefic, Mercury, closely afflicts the tenth lord, the Moon, in the tenth house. The lord of the house of development is weak due to its being in the state of old age. Disproportional growth of the physique retards normal mental growth as well. The yogakaraka Saturn's position in the second house, which is exalted in navamsa in this case, has, however, not allowed the retardation of the mental functions. The medical diagnostic facilities in the top institutions of the country have neither been able to diagnose the causes of excessive corpulence, nor provide any relief from further growth. The operating period is that of the functional malefic, Mercury. This is to be followed by the dasa of Ketu, which is badly afflicting the ascendant by conjunction and fifth, seventh and ninth houses by aspect.